Of all the hundreds of flavours available, vanilla continues to top the list as the world’s most popular taste sensation. 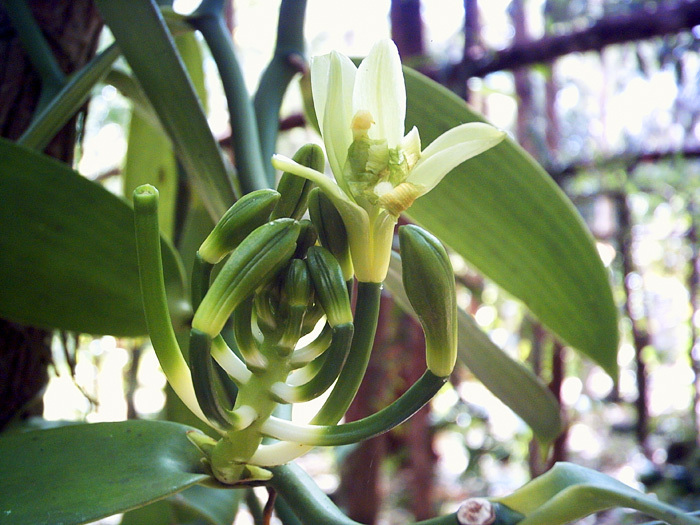 Vanilla is derived from climbing orchids native to Mexico and the name comes from the Spanish word “vainilla” meaning “little pod”. The first farmers of vanilla were the Totonac people who inhabit the eastern coastal and mountainous regions on the Gulf of Mexico, near present day Veracruz. According to legend, the tropical orchid was born when Princess Xanat, forbidden by her father from marrying a mortal, fled to the forest with her lover. They were captured and beheaded; and it is said that the vine of the orchid grew where their blood touched the ground. Vanilla was completely unknown to the world until Spanish explorers arrived on the Gulf Coast in the early sixteenth century and they took the vanilla to Africa and Asia. It was originally believed to only have value as a perfume however, it wasn’t until Cortes arrived in 1519 that the Spaniards learned it was also a flavour. Until the mid-19th century, Mexico was the chief producer of vanilla and was naturally pollinated by a native bee. However, in 1819 French explorers shipped vanilla beans to the Réunion and Mauritius islands with the hope of producing vanilla there. It wasn’t until after a 12-year-old slave from Réunion Island discovered how to pollinate the flowers by hand in 1841, the pods began to thrive. Soon the tropical orchids were sent from Réunion Island to the Comoros Islands and Madagascar along with instructions for pollinating. By 1898, Madagascar, Réunion, and the Comoros Islands were producing approximately 80 percent of world production. The market price of vanilla has followed a peak and trough pattern since the 1970s with peak prices being driven mainly by production levels in Madagascar, which can be affected by political instability and poor weather, such as cyclones. The last dramatic price rise saw vanilla prices peak at an astonishing US$500 per kilo in 2004, brining new countries to the vanilla industry. A good crop, coupled with decreased demand caused by the production of imitation vanilla, has driven the market price back down and has remained stable since. Madagascar still accounts for half of the global production of vanilla. Mexico, once the leading producer of natural vanilla with an annual 500 tons, produced only 10 tons of vanilla in 2006. The United States is the world’s largest consumer of vanilla, followed by Europe, especially France. The current worldwide annual demand is for 2200 -2500 tons of vanilla. It is hard to say exactly when vanilla was first introduced into Australia; however it was first recorded to be growing in the Brisbane Botanical Gardens in 1866. From there it was distributed to northern localities in 1866, 1872, 1874 and 1885. However nothing seems to have come out of these early plantings. It wasn’t until the Kamerunga State Nursery in Cairns, North Queensland, received and planted their first cuttings from Fiji in 1901 or 1902 was it discovered that the tropical north had the ideal climate, soil and landscape to grow and cultivate vanilla successfully. This document goes on to list the suitability of the tropical north from climate to rainfall, as well as going as far as to show how little effort is required to prepare the land as the Australian bush appears to require very little clearing to start with. The work also outlines the potential marketing options, as well as possible returns and cost of production. It is not known why the venture was not taken further when it was considered to be such a highly profitable crop. In recent years, several individuals have investigated the idea of growing vanilla in the north of Australia, with some even being awarded government grants to learn how to grow and process beans from overseas. So far, there are no stories of success, with the exception of Daintree Vanilla & Spice and a few other small growers in the region.